Three new exhibitions featuring St Ives artists open this weekend. Coastlines - new work by Seb West and Glyn Macey. Seb's massive linocut: 'St. Ives Rooftops' will be on display here for the first time. The piece has been over four years in the making, and contains well over a thousand hours of work. Opening on Saturday (11th August 2012) from 7.00 pm at The Crypt Gallery on Norway Square. Runs until Friday 24th August. Affordable Art Show - work by St Ives Arts Club members at sensible and sometimes incredible prices. Opening on Sunday (12th) from 6.00 pm at the club on Westcott's Quay. Runs until Thursday 30th August. Wood Vibrations - fine art by Lauren Sebastian. Opening Sunday (12th) from 6.30 pm at Cafe Art on Royal Square. Runs until Friday 31st August. 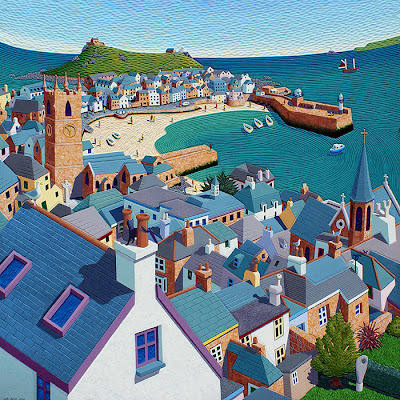 Hansel Gallery - Tregenna Hill (just a short step from Cafe Art and St Ives Arts Club). Highly original work by Steve Petrucci Fox and Deryl Petrucci. Caroline Atkinson - Harbour Galleries Wharf Road (just a short step from The Crypt Gallery). Beautiful Cornish landscapes and seascapes.